The Runco SP-60 plasma television is a current model that began product life in early 2007. Due to the company’s smaller product production, Runco does not change model lineup as frequently as larger manufacturers. As a result model life is often a year and a half or more. This is not necessarily a negative if the models produced are of excellent quality and price corrections are made along a product models life cycle to stay in line with other manufacturers. New model production is one way that larger TV manufacturers control price reductions. The plasma display element (i.e. glass) contained in the Runco SP-60 is likely manufactured by NEC/Pioneer. The resolution of 1365 X 768 is the same as an NEC/Pioneer resolution and the XA model is an high altitude model rated to use up to 9000 feet. This is also the same specification as NEC’s high altitude model. As well, there were many similarities between the NEC and Runco’s menu design, setup and functionality. Picture Calibration: The Runco SP-60 plasma comes pre set out of the box to 0 values in the setup menu. Menu settings are not preset to obnoxiously high contrast ratios and brightness levels as most consumer models due to the fact that Runco TVs are not displayed on showroom floors of big box retail stores. There are also no preset picture settings such as Vivid, Standard, Cinema as with most consumer models. Indeed the picture setting menu is very tight on this plasma TV meaning the spectrum of possible adjustment is small. For instance I recognized almost no difference in edge enhancement capabilities when adjusting the Sharpness setting from –7 to +7 – the minimum to maximum adjustment. Tight picture settings are not necessarily an adverse circumstance if the starting picture color temperature and grayscale are in an accurate range. This is the case with the Runco SP-60. 720p/1080i/1080p Picture Quality: Must take off a couple points here for the 720p resolution. Normally, 720p is no set back but with a 60” HDTV it can help with Blu Ray. Set up and testing showed a slightly better picture using 1080i than 720p. We viewed a recent Blu Ray disc version of The Manchurian Candidate which has a tremendous variation in color and dark shades. Black levels produced by the Runco were extremely deep with the digital HDMI (to DVI) signal. 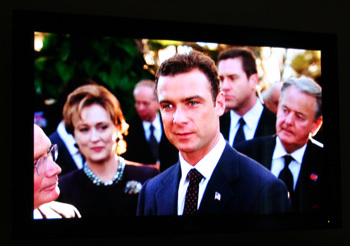 Blacks appear over saturated against bright backgrounds in some scenes such that the plasma television lost shadow detail in the navy officers uniform of Denzel Washington’s character. As a result of the incredibly deep blacks, which I would expect from the NEC/Pioneer panel, there was excellent contrast and color information was extraordinary. Runco recently dropped the MSRP price on the SP-60 to $8995.00. The picture is very good but the feature set is nothing special and certainly this is more than a premium price for a brand. By comparison the Pioneer PDP-6010FD runs less than $5000 and the LG 60PC10 less than $3000.